Aspiring racing drivers were given a new route into the exclusive world of international motorsport today with the announcement that the A3 Racing Series will kick-off in South Africa this July. 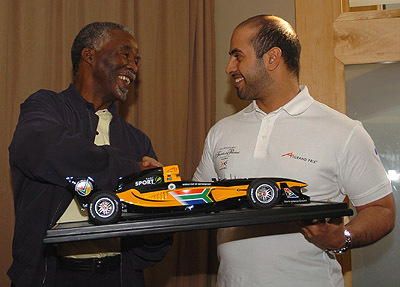 Standing alongside President Thabo Mbeki at the annual Friends of the President's Golf Day, A1 Grand Prix Founder, President and Chairman Sheikh Maktoum announced the introduction of the A3 Racing Series. "I'm delighted to announce A3 racing series, a new feeder formula which will develop future A1 drivers from developing nations in preparation for the inaugural season of the first World Cup of Motorsport this September. A3 will provide a platform where drivers can develop their physical and mental skills, learning to race against each other on a global level. The A3 Racing Series shows A1 Grand Prix's commitment to develop drivers from all nations and I hope to see A3 established in all nations competing in the World Cup of Motorsport." The A3 Racing Series launch will be on Tuesday 24 May.